If you're googling for great video games to play online, you might type in something along the lines of, “number 1 online action game.” Among other inferior games, this search will give you the legendary Counter Strike, which lives up to that search's context exceedingly well. Counter Strike was first released in June 1999 as a simple mod of Half-Life, a popular computer game. With continuing updates, the mere modification became its very own game. Counter Strike was eventually released on the Xbox in November 2003 published by Microsoft Game Studios. The immerse online multiplayer will give you more than enough pleasure to stick with it for countless hours. The community that surrounds the game is vast and incredibly dedicated to the game. Counter Strike, the most played installment of the famous Half-Life, should be forever canonized as one of the most influential games in video game history. Counter Strike's gameplay sets it apart from any first-person shooter that precedes it. The beginning of the match presents the player with the choice of being either a Counter-terrorist or a Terrorist. Once a side has been chosen, the player is given a small amount of money and a limited amount of time to purchase their preferred weapons, ammo, and equipment, which is repeated at the start of each round. When time is up, the round starts and the players are free to move. The buy area is still available to buy items, but only for a limited amount of time. There is more than one way to win a round and the winner of the match is determined by whichever team wins the most rounds. For each team there are different ways of winning a round. 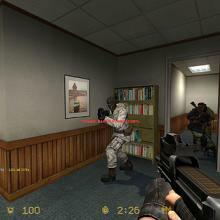 For a Terrorist, the team of players must either defend a planted bomb at one of three bases, make sure that the Counter-terrorists don't rescue all of the hostages before the time is up, or just kill the entire Counter-Terrorist team. For the Counter-Terrorists, to win the round, they have to either kill all of the Terrorists, diffuse the bomb, or rescue the hostages. Dying in the round will reset the player's weapons and equipment and surviving allows the player to keep their equipment. Winning the round gives the team a money bonus. There are many different scenarios in which a player must make a tough choice. For example, when the bomb is planted by the Terrorists, the Counter-Terrorist(s) with a bomb diffuse kit must go diffuse the bomb within a specified amount of time, which is expressed by a beep that sounds more frequently as time goes on. This adds an element of suspense and a difficult decision to make for the Counter-Terrorist. Should the gamer attempt to diffuse the bomb, he may run into a Terrorist camper who will probably have the upper hand because of the difficulty in finding his actual position. The Counter-Terrorist also has to think about how much time he actually has to diffuse the bomb because if it explodes and kills him, he will lose all of his equipment and have to spend money to get it back. There are many monetary advantages and disadvantages to observe in Counter Strike, which gives it much more depth than most any game will have. The online element of Counter Strike is what really sells this game to most players. While there is no actual campaign in Counter Strike, there is a single player mode that allows the gamer to play against bots in the game on any of the maps downloaded in order to practice. However, without the online play, or at least a local multiplayer match, gaming wont' be as fulfilling. Once you achieve that online play, your Counter Strike play will instantly become much more rewarding. The level you experience when you first start online play will be undoubtedly overwhelming. There are a lot of veterans of the game that will run over any innocent newbie that obliviously makes the mistake of teaming up against these kings of Counter Strike. However, once a gamer plays the incredibly intuitive yet deep game, he/she will be able to keep up with these experts, but the legends may still steamroll even the most confident gamers. Once involved in the Counter Strike community, much more will open up to the gamer. The first interaction of this community might be something as simple as meeting somebody in the community while in a math who is willing to let you join them. Many sub-communities are based on forums online where the gamer can request to be in the guild, which is a group of gamers that play online together. These guilds are usually organized by a guild leader who sets up times to play against other guilds and even enter the guild into tournaments where the best guilds can gain fame and sometimes win money depending on the tournament. There's also another element that spawns from the online community that makes Counter Strike stand out among the rest. User-created content puts Counter Strike on the pedestal of first-person shooters. This classic's community really shines through in this aspect. This huge phenomena can only be explained by the spirit in which the game was created and the gamers' pure love for the game. No other game compares the to massive extent of user created maps and modifications for Counter Strike. In many ways, Counter Strike set the standard for mods created for FPS. There are many mods that help the gamer consolidate his/her information into an easily readable and exportable fashion. There are mods that actually change the objectives like a zombie mode. Gameplay mods can include an automatic aimer that targets the head of the enemy for devastating head-shots, a mod that shows the gamer where his/her enemy is looking, and even a mod that lets you choose from a selection of knives each with different powers. There are also mods that merely change the appearance of the players into the pumpkin king or the just the colors that make a neon rainbow colored gun. All of which have practically defined the nature of modding for FPS. All in all, the sheer mass of user created content shows anyone that in the eyes of the gaming community this is a noteworthy game. Counter Strike's simple yet profound gameplay has refined the FPS genre into what we know it to be today. It's online community more than speaks for it's deserving reputation by their numbers that reach over sixty-thousand a day to playing the game, even after it's release over a decade ago. But if nothing else, the amount of mods created by this game is almost beyond comprehension. There are so many people vested in this game that care enough to heighten the games reputation by providing it's gamers with a plethora of mods that have defined the way other hackers create mods for most other games nowadays. Because of it's revolutionary gameplay, huge and dedicated community, and the massive amount of mods, Counter Strike is more than deserving for canonization. "Counterstrike - Google Search." Google. Web. 31 Mar. 2011. . "Counter-Strike." Wikipedia, the Free Encyclopedia. Wikipedia, 29 Mar. 2011. Web. 31 Mar. 2011. .
FPSGamer. "Counter-Strike: Source Mod: 100 Mbps Fast File Download Servers." Strategy Informer: Feeding Your Games Addiction. Strategy Informer. Web. 31 Mar. 2011. .
"Knife Mod." Counter-Strike Mods : Counter-Strike SOurce Mods : Mods For Game Servers. GameData. Web. 31 Mar. 2011. . Steam. "Steam: Game and Player Statistics." Welcome to Steam. Valve, 31 Mar. 2011. Web. 31 Mar. 2011. .